This week we'll be talking about Rock Dust with Founder of 'Rock Dust Local' in Vermont, Thomas Vanacore. In 1991, Tom decided to try his hand at starting a small business sourcing and delivering local rock dusts to regional farms. This would be a first step to introduce 'remineralization' to area growers. But as Tom says "I couldn't give it away". But times have changed. 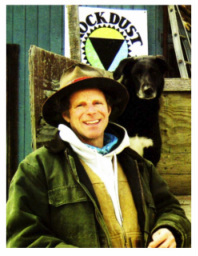 25 years later, after continual work with rock dusts in organic farming himself, and building up a network supply of regional sources, Tom and Joan, his wife and partner of over 15 years, decided to try again. Rock Dust Local set up shop at a local Farmers Market in Vermont hawking 5 and 10 lb. bags of "Local Rocks for Local Crops". That's how it got restarted in 2010. From there Rock Dust Local began delivering rock dust in bulk to regional growers interested in nutrient dense farming. Rock Dust Local is the first company in North America specializing in the local sourcing and delivery of the BEST (Broad Elemental Spectrum Tectonic) rock dusts for remineralization, enhanced weathering, and the best in Biochar formulations nationally. Join us and learn how Rock Dust can revive your garden and the planet!